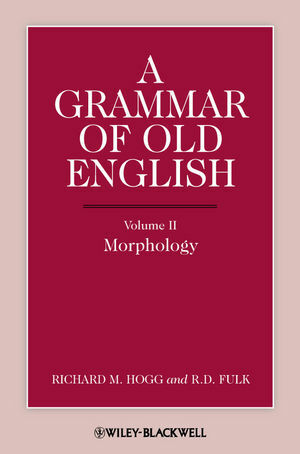 A Grammar of Old English, Volume II: Morphology completes Richard M. Hogg's two-volume analysis of the sounds and grammatical forms of the Old English language. The late Richard M. Hogg was Professor of English Language at the University of Manchester. He was the General Editor of the Cambridge History of the English Language and author, with C. B. McCully, of Metrical Phonology: A Coursebook (1987), and editor, with David Denison, of A History of the English Language (2008). R. D. Fulk is Chancellor's Professor of English at Indiana University. His books include The Origins of Indo-European Quantitative Ablaut (1986), A History of Old English Meter (1992), and as editor, with Robert E. Bjork and John D. Niles, Klaeber's Beowulf and the Fight at Finnsburg, 4th Edition (2008).